Learn to make No Churn Peach Blueberry Ice Cream Recipe with step-by-step video tutorial. This ice-cream is super creamy and packed full of peachy, blueberry and almond flavor. Kind of the perfect combo if you ask me. The good news is that it is egg-free. And no ice-cream machine is needed to make this. To give that a nice crunch and nutty texture I added some ground almonds, and it was just SO GOOD. Some blueberry jam on top for that EXTRA punch. YUMMY! What could have been better than the inclusion of two of my favorite fruits in one of my favorite dishes? Yes, you might have guessed it right. They are peaches and blueberries. Peach season is here again. Of course, blueberry season is here too. But for making ice-cream I personally like using frozen blueberries. I somehow feel they give much for flavor and color. This time when I bought my peach packet I knew I am gonna eat them as they are, so I bought some EXTRA. That way I can also get some nice amount of peaches to make a recipe. I could think of no better way to enjoy peaches than to make my own peach ice cream. Anyways good peaches should not be wasted — they should always come in a summer recipe. I’m not sure if there is any food more closely related with summer than ice cream. It’s cool, refreshing, and there’s a favorite flavor for everyone! Even though it’s pouring cats and dogs here since morning, but I still want this Peach Blueberry Ice-cream. Doesn’t matter if it’s getting colder again, or there are chances of thunderstorm and lightning, and there is no bright sunshine and only dark when I see outside, I still want this Peach Blueberry Ice-cream. These days Adoria shoots thousands of questions in a row, and she wants me to answer to all of them. And if by any chance I don’t reply to one of the questions, she wouldn’t stop saying ‘Mommy’ in a row until I reply to her! I don’t know how and when she turned into a little tattler, but the truth is that she wants to talk all the time. I want to ask this to all the beautiful mommies, does all your little ones do that? Do all the girls do that? I certainly don’t know anything about all the little girls, but she talks a lot. Her talking is so much fun when I am standing beside the window and sipping my coffee, or cooking something. But when I am working on the computer, then her frequency of questions increases. Luckily, we have teachers: I only realize this now when Adoria is at home all day due to her summer-break. I am so thankful to her Kindergarten teachers who take care of all the kids day long so the parents can work with passion. It feels so good when you see your child doing something which you hadn’t taught him or her. The teachers are the ones who are shaping our children’s lives in becoming good and learned human beings. Hats-off to them. I love all things with blueberry and peaches, so this was the combo which came into my mind when I thought about making ice-cream on Friday. To give that a nice crunch and nutty texture I added some ground almonds, and it was just SO GOOD. Some blueberry jam on top for that EXTRA punch. YUMMY! It’s super creamy and packed full of peachy, blueberry and almond flavor. Kind of the perfect combo if you ask me. The good news is that it is egg-free. And no ice-cream machine is needed to make this. I promise, it’s super quick and easy, and this recipe does not require an ice cream maker. In Adoria’s words, it’s easy peasy. This delicious homemade peach blueberry ice cream combines two summer favorites…peaches and blueberry! Fresh, ripe peaches are delicious on their own, but when you combine them with frozen blueberries into a creamy homemade ice cream, you have a really special treat! Start here: If you’ve never made homemade ice cream before, this would be a perfect recipe to start with. This peach blueberry ice cream recipe is very simple, but it produces outstanding results! The process summary: Whisk whip cream. Add sweetened condensed milk, vanilla and whisk again. Add blueberry, peach and fold gently. Freeze this beauty. Scoop in cones or cups. And like any other ice-cream this is also sCREAMing for an attack. So what are you waiting for — JUST ATTACK! 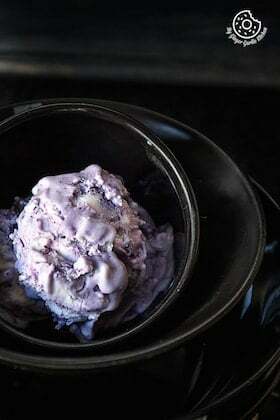 This No Churn Peach Blueberry Ice-Cream Recipe would just ENERGIZE you. This is because it is all ELEGANT. It is all EASY. It is all EXOTIC. This ice-cream is super creamy and packed full of peachy, blueberry and almond flavor. Kind of the perfect combo if you ask me. The good news is that it is egg-free. And no ice-cream machine is needed to make this. To give that a nice crunch and nutty texture I added some ground almonds, and it was just SO GOOD. Some blueberry jam on top for that EXTRA punch. 1. Place the heavy cream into a large bowl and whisk on a medium speed until soft peak. 2. Add the condensed milk and vanilla extract and mix until combined. 3. Add the blueberries and peaches and fold gently, just until they’re all covered. Don’t over mix. 4. Pour into a freezer safe tin or container. 5. Sprinkle ground almond on top. 6. Cover with cling film and place in the freezer for 6-­8 hours, or overnight. 7. 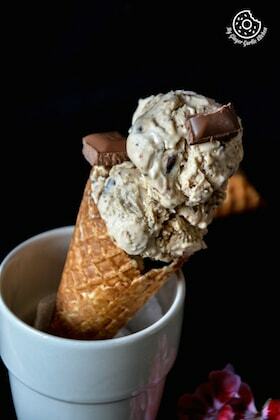 Scoop out ice-cream in a cup or cone. 8. Top with some blueberry jam and sprinkle some ground almonds.